Hugs, hope it all turns to good. Many times, "living the dream" IS living the simple life, so cherish those moments and keep doing what you're doing. I'm not much for change either. I'm a creature of habit. Embrace the challenges though. That's God working on your edges and fine-tuning you to be better and stronger. And you are definitely being the best friend you can. Change is the only constant in life, or so it seems. One of the great ironies. Sending thoughts your way, my friend! Oh yeah. We're constantly adapting to a new reality, and as such, I make a regular practice of decluttering the schedule. I long ago quit doing crafts or decorating my house. I quit watching TV or movies. (With the occasional exception.) Most things have fallen into a rigid calendar so sanity remains. Truth, I think the prime of our lives is the busiest season. Maybe I'm wrong, but it sure seems to be that way. And who told time it could exponentially get faster the older you get? That's just not cool. Everyone has a different normal, depending on one's formative experiences or current realities. Sometimes certain experiences shape us so much we'll never really be so-called normal again, or never were so-called normal. The most important thing is to use those experiences to create a better tomorrow. Millennials are interesting creatures: 1) They look at all they have and it's not enough, 2) everything that they tell me is supposed to blow. my. mind. 3) if they use Spotify, they really should listen to the Cure because it could dispel all that optimism instilled by helicopter parenting, 4) they are besieged by cynical Generation X'ers who are exhausted with them (like me!) 5) They have zero game, 6) they have personal branding at the forefront of their minds, and 7) they are not just "super." They are special too, just like a snowflake. So here is my cure for you. Hang out with more generation X'ers and you'll feel so much better about yourself in no time at all! Hey Morgan, I feel like my life has been one change after another for the last two years. Some were good, some were heart wrenching. The more I think about it, try to put it into a larger context, I realize that our lives are on constantly shifting sands. Maybe the need to better understand that is what makes *some* of us turn to writing. Make a list. Make a list of your top three goals in life - and don't think any of them have to be writing related. If they are, great. Tack that list up next to your bed and look at it every now and then. Everything will fall into place. Cheers to plastic spider rings! Those feelings are important to hold on to. For me, its the cool air and the rising moon behind the trees on a dark October night...I love this time of year, can you guess? 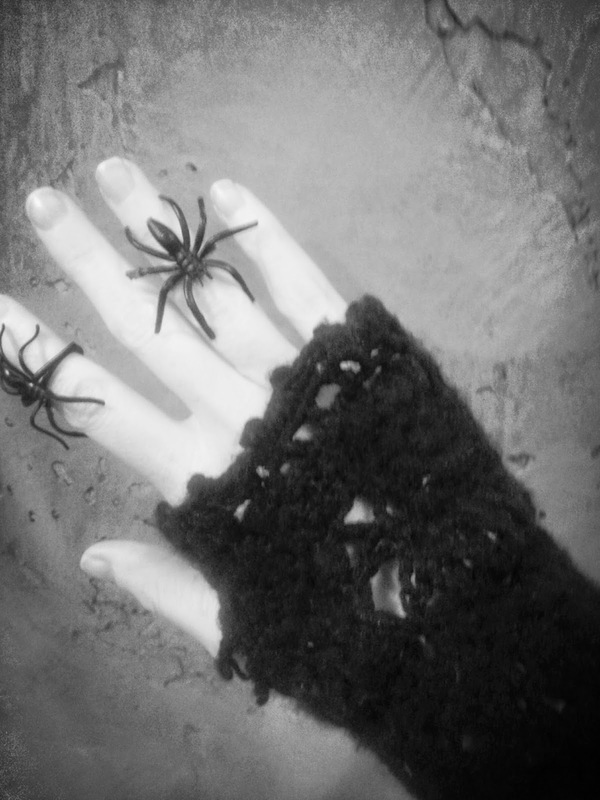 And, even better, 10 plastic spider rings! One for each finger! Because that's just awesome! Except they don't fit on my fingers anymore. Advice is only individually good, so I have none for you. Some moments, that's enough. That's true. And the best way to live life, and live the dream is to find those moments when you know, this is life, and it's enough. Adventures are good when you can have them, but life isn't just made up of adventures, it's made up of the little bits of living in between. And sometimes in life all we can do is hang on and wait for 'normal'. Sometimes just having a good day can be your greatest adventure. Being happy matters more than having a lot. Insightful post Morgan. As most writers, you seem to have worked through your internal fog and pain. Each stage of life is challenging since we learn by doing ... and failing. But if you have your health, you have wealth that later on in life you will realize you did not appreciate enough. A body that is not stiff and does not hurt constantly in all the thousand ways it does later on in life is truly a treasure. I worked with a 84 year old woman who was not as spry as she once was. A younger worker mocked her slow gait directly behind her, beaming a smile at me as if I would appreciate the joke. I merely raised one eyebrow and thought how in the future life would gnarl her fingers and stoop her spine -- then how funny would she find it? The true dream is still being able to have fun playing with those plastic rings. Yeah, yeah, live your life, but it's in the details where we find out happiness. Like wearing the spider ring to work and making one coworker jump and the other one roll their eyes. Someone said this to me when I was young and it actually turned out to be true. She said life gets so much easier as you get older. When you're young, you're still trying to figure out who you are and where you're going. Once you reach your 30s, 40s...and beyond, you just become so much more comfortable in your skin. Ironically, you long for your youth, which is weird because you know you're happier than you were back then! I think we all want the looks and energy we had when you were young with the wisdom and comfort you have when you're older. Hi Morgan, hugs. Life is a challenge, that's for sure. You are an awesome friend. What is the saying, life is what happens while you're making plans? Honestly, I am not sure that we ever get a handle on life. As soon as we think we know what is going on, snap... it changes. Accept that you aren't going to always get it right. Do your best and learn how to let it go. (I am terrible at letting things go... it's been a lot of work for me to get to a place where I let go and just accept.) We all long for those days when we were young and our problems were small. Of course, at the time they didn't SEEM small. Just like they don't now. If you can accept where you are RIGHT NOW and just enjoy living in the moment... I think that is the key. Yes, what Robin said about living in the moment. I think sometimes people focus so much on the "good things" owed to them in the future that at a certain point they just stop enjoying the present. Think the carrot dangling on a string in front of the horse on a treadmill. That's no way to live a life. Work for more and always strive to improve yourself, yes, but enjoy your life in the present and don't judge your success by the success awaiting you in the future. One thought to add to some very good comments. If you are concerned with being a good enough friend, you are one. Yes, it's me, the alleged human of Penny the Jack Russell dog and modest internet superstar! Yes, my name is Gary. As we both know, life has so many twists and turns. Yet, the now can be all we want it to be. To be part of that dream which moulds our reality. You are finely tuned to the winds of emotion. A writer seizes that tuning and even the worst moments verbalised can see that good can come from the most unlikely of sources. Keep living and sharing your dream, dear Morgan. Yes, life is hard. It's forever evolving... take it from one who has lived many lives. And has many more. As do you. Breathe. Let your tensions flow from your fingertips and generate out into nature. You will rejuvenate. A crisp wind is in the air. Even though life seems to be fading it is only taking a short nap. I know your frustrations. I honestly wish I could say it will get better in middle age. But life seems to throw up barriers and the older you get the more difficult they SEEM... But there is also a peace. You will know yourself. You will understand why you are here and what you are here to do.Your creative self will never die. It may go on hiatus for what seems like a lifetime, but amazingly it will return and flow through you like molting lava ready to erupt. For you, at this time, your family plays a very important part in your life. Molding four lives and nurturing them is not one, but two full time jobs. You took on great responsibilities at such an early age. In time... the answers you seek will reveal themselves to you when you least expect it. I am still waiting for several answers myself. LOL. It doesn't get easier, BUT it's part of living. And there is always something new and exciting just waiting around the next bend. I love this. I think that's why God gives us kids, to make us slow down and enjoy the fun stuff. I have gotten that sense of change before, yes. I've been very introspective recently, unhappy with myself, trying to figure out some things. We all need to have these moments to figure out where we're going next. That's a great perspective to have! Why should we doubt the choices we've made? As long as we're alive it's never too late to change, right? Sending hugs, and happy thoughts. Focusing on the simple things IS your way of capturing the moment. As a writer, you are more alive than most of the people out there. Just go with the flow and all will work out in the end. Life is definitely a roller coaster for sure. However, it sounds like you have it under control and doing a great job adapting and learning and growing and I think that's what life is all about in the end. Send you some uplifting vibes! Love this post. Your examples are exactly why it's important ti write down what we're experiencing, if only for comparison. I'm happy this year is so much better.